The nutritional information provided on this website is derived from testing, published resources or from information provided from recommended suppliers. It has been calculated using recommended standard product formulations and serving sizes. Substitution of ingredients may alter nutritional values. Products are made fresh and are mixed individually in stores, and may therefore vary from standard formulations and sizes depending on the preparer of the product purchased and the particular ice cream mix. 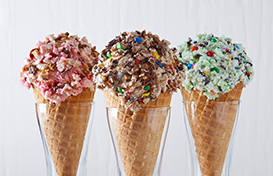 Marble Slab Creamery is individually owned and may purchase ingredients from vendors outside of our recommended lists. The dairy product used to make ice cream in stores is purchased from local dairies. Differences may occur in the nutritional values of the dairy products purchased depending upon the region in which the store is located. In addition, product formulations change periodically. You should expect some variation in the nutrient content of the products purchased in Marble Slab Creamery. Some items listed may not be available in all stores. This list may not include test products, limited time offers, and regional menu variations. This information is correct as of July 2009, unless stated otherwise.